This past week, we took a mini road trip to Duluth, MN to attend Upper Lakes Foods' Fall Food Show. Upper Lakes Foods (ULF) is a small, family-owned and operated restaurant supplier celebrating their 50th anniversary. For several decades, ULF has been sourcing quality products and connecting restaurants with local, regional, and sustainable food producers. Rita Rasmuson, owner extraordinaire of The Watershed Cafe, approaches the food show with high expectations and a whole foods mentality. She is always looking for farm-fresh, natural, organic, raw, and unprocessed products with few and simple ingredients. She supports small, family owned and operated farms or businesses in Wisconsin or Minnesota that operate with ecological business practices. Here are a few highlights of the show! Jones Dairy Farm stand: Jones Dairy Farm, located in Fort Atkinson, WI has been farming for more than 128 years. For six generations, this family-owned business has been producing natural, high quality meats from the farm. Jones Bac'n Bones are a Watershed special featured on select Saturdays and Sundays. These pork baby back ribs are cured in small batches using a 100-year-process, then naturally slow smoked over real cherrywood. The ribs are tender and juicy, and taste like bacon! 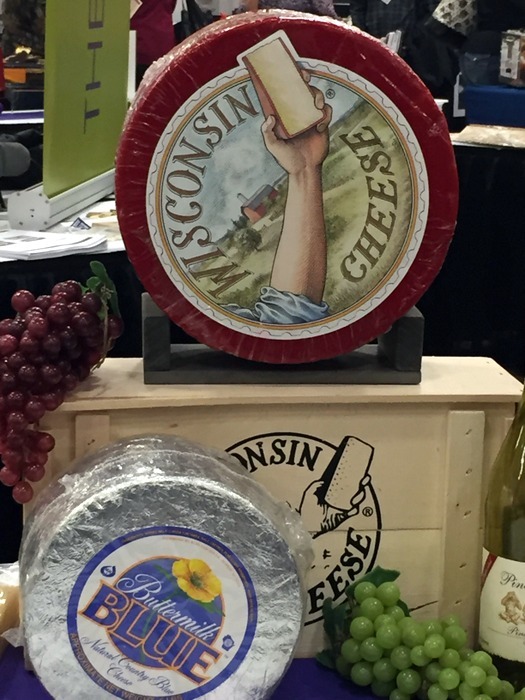 Wisconsin Cheese stand: Wisconsin Cheese produces world-class, artisan cheeses crafted by master Wisconsin cheesemakers. Rita is very familiar with the many varieties of Wisconsin Cheese, and her wealth of knowledge is amazing. Before the vendor could give her spiel on the cheeses, Rita surprised her and began describing the award-winning and internationally acclaimed cheeses she had tried. Only Rita could impress the most impressive cheese vendor in the nation! The Watershed Cafe features a selection of craft cheeses from Wisconsin Cheese on our cheese board. Watching Rita interact with leaders in the industry is fascinating. She is strong and intelligent. She knows what she wants, she has done her research, and she holds vendors to high standards. On this endeavor, I learned more about Rita's core values and her process for choosing the fresh, natural, and sustainable ingredients she uses in order to create the flavors of The Watershed Cafe.